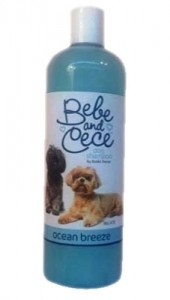 Home » Grooming » Shampoos & Conditioners » Bebe & Cece™ - Ocean Breeze - 16 oz. 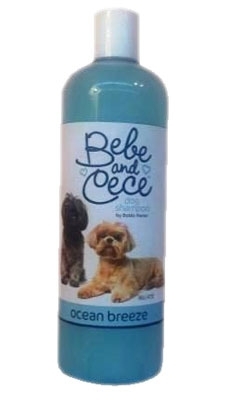 Bebe & Cece™ - Ocean Breeze - 16 oz. Ocean Breeze - Refreshes skin and fur as it gently cleans; Leaving your pet shiny, soft and smelling as clean as a cool ocean breeze! 16 oz. Bobbi Panter Natural Pet Products has launched a new line of premium dog shampoos. The new Bebe and Cece dog shampoo line use quality ingredients, and includes Precious Puppy, Oatmeal & Shea Butter, Ocean Breeze, Fresh Berry and Orange Citrus. The suggested retail price for a 16-oz. bottle is $9.99. Tags: Bebe & Cece™ - Ocean Breeze - 16 oz.